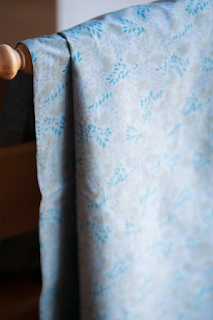 I bought a length of ivory-colored silk printed with little teal leaves and little gold butterflies. Why did I? I know I can't wear ivory. I decided to dye it--I had nothing to lose, because like I said, ivory. I used a box of forest green dye and got this gorgeous noncommittal gray-green. Love it! It will be a dress. Great idea! I've never tried dyeing.